The 2019 International Basketball Federation (FIBA) Basketball World Cup will kick off in eight cities in China including Beijing, Shanghai and Guangzhou, Guangdong Province, from August 31 to September 15, 2019, marking one of the largest international sports tournaments to be hosted in China after the 2008 Beijing Olympic Games and before the 2022 Beijing Winter Olympic Games. The Chinese technology company Tencent will partner with the 2019 FIBA Basketball World Cup as the world's top partner and the exclusive partner for digital media in China for the event. 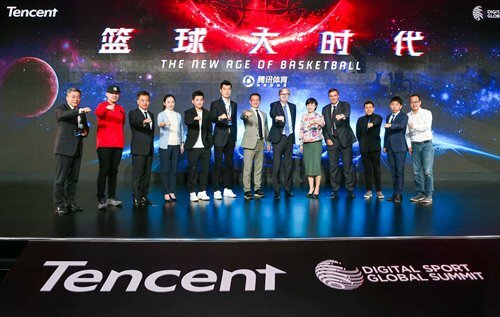 Tencent is authorized to broadcast and distribute 60 FIBA international basketball events, including the 2019 Basketball World Cup, and bring users live, on-demand short video highlights via new media channels. "Basketball is very popular," Chen Juhong, vice president of Tencent, said in an opening speech. "Tencent and many other partners have made a very useful practice of exploring how to serve core fans our most professional capability, and to attract new fans with a combination of sports and entertainment." According to the 2018 China basketball industry report released by Penguin Intelligence, the number of basketball fans in China account for nearly 50 percent of all sports fans, and it also shows a more diversified trend. "Although the focus is still on the game, the entertainment element has taken more of the fans' attention. Nearly 80 percent of young fans want to see more of the game as well," Penguin Intelligence's Editor-in-Chief Wang Guan said. Tencent has followed the trend of combining sports and entertainment. The Super Penguin League Ultimate Game, for example, is Tencent's third annual celebrity basketball event, which took the company three years to turn it from a game show of 1 million spectators into a league event with 50 million spectators in a single quarter. According to Frank Leenders, FIBA's director-general of media and marketing, there are good expectations for the swift developing trend of basketball activities that 2019 FIBA may bring about to China and to the world, and he hopes that the basketball culture can be further spread in China through the 2019 FIBA World Cup.